Ahead of her publication in Cell out online today, Victoria Deneke, Ph.D. of the Di Talia lab took our 5 Question Challenge to give us more insight into her time at Duke and her recent work titled: Self-Organized Nuclear Positioning Synchronizes the Cell Cycle in Drosophila Embryos. One of the most extraordinary moments for me was watching the dynamics and organization that takes place in a developing organism for the first time. I am still in awe of the beauty of development and it is what keeps me motivated to understand more and more how this occurs in living systems. Briefly describe your breakthrough discovery that led to the publication of this paper? We have discovered in fly embryos the mechanism by which local biochemical cell cycle signals are integrated with the mechanical properties of the embryo to ensure accurate positioning of the nuclei. We have also shown that this process is necessary to maintain cell cycle synchrony throughout early development. More broadly, our work elucidates how self-organized biochemical and mechanical dynamics can arise in embryos and uncovers an important biological function of cytoplasmic flows. These findings were made possible by a biosensor, which I was using in my previous studies (Deneke et al., 2016), measuring the activity of Cdk1 and PP1, two important proteins that regulate the cell cycle. One day we were imaging this sensor and we happened to start a movie at a very early time point in development. We immediately noticed that the cell cycle oscillations were distributed in a spatial pattern different from that expected from published studies. Specifically, we saw that oscillations were restricted to a specific location and gradually expanded during subsequent cell cycles. That observation prompted us to ask whether there could be a functional significance to these local biochemical oscillations and led us to identify the model defined in our new paper (Deneke et al., 2019). Why is this discovery important to the field of Regenerative Biology? During regeneration, a damaged organ must heal in order to regain its functional size and shape. At the heart of this process are morphogenetic events that rely on the integration of biochemical and mechanical signals to coordinate growth and proliferation in space and time. Our study provides a novel quantitative model and framework for this integration and will inspire similar studies in more complex multicellular systems. What was the most memorable experiment in your years in the Di Talia lab (whether it was successful or not)? Figuring out how to introduce a barrier in the embryo was definitely one of the most memorable experiments in the Di Talia lab. We wanted to know whether the waves of division that we were observing could go through a barrier or not (Deneke et al., 2016). We tried all kinds of things, from using a high-power laser to ‘cauterize’ a part of the egg (think light saber cutting an embryo in half) to using optogenetics to molecularly introduce a barrier. As much as I would have liked for either of these tools to work, they didn’t. The light saber experiment ended up exploding embryos or generating a heat wave that “cooked” the egg, which was cool to watch but not useful for us. We then turned to a paper from the 70s that used what we call in the lab an “embryo guillotine”. This apparatus consists of a dull razor blade that has been mounted on a bar that you can precisely lower with a set of knobs at each end. We contacted the Duke Physics Machine shop to build this for us and we gave it a try. To our surprise, we could introduce a barrier using this method and more importantly, we found that the wave did not go through the barrier, suggesting that diffusion was necessary for the wave to spread. What comes next for you? Or the research? I continue to be fascinated by the amazing dynamics and emerging patterns inside living systems, especially during development. I’m intrigued to keep studying dynamical processes, now at the very earliest moments of life, in other words, right after fertilization. I’ll be starting a postdoctoral position in Dr. Andrea Pauli’s lab in September of this year, where I will be studying spatiotemporal coordination following fertilization in zebrafish embryos. Dr. Alejandro Sanchez Alvarado, an Investigator at Stowers Institute, is a world leader in mechanisms of tissue regeneration. In the mid-1990’s he initiated a novel program employing molecular tools to explore the spectacular regenerative abilities of planarian flatworms. His groundbreaking work over the past two decades has revealed key secrets behind the neoblast stem cells that enable planarian regeneration, and has launched successful independent careers for an impressive list of investigators who once trained with him. Please join us at this special seminar hosted by Regeneration Next and the School of Medicine. In 2017, Regeneration Next received an Intellectual Community Planning Grant to seed collaborative teams, a priority outlined in the Together Duke Strategic Plan. Our goals for grant outcomes included better communication amongst researchers, engineers, clinicians, and experts and ultimately more effective translation of tissue regeneration research to potential treatments in an ethical and safe manner. We focused on two strategies: building multidisciplinary research communities at Duke, and increasing recognition of Duke’s regenerative medicine strengths. 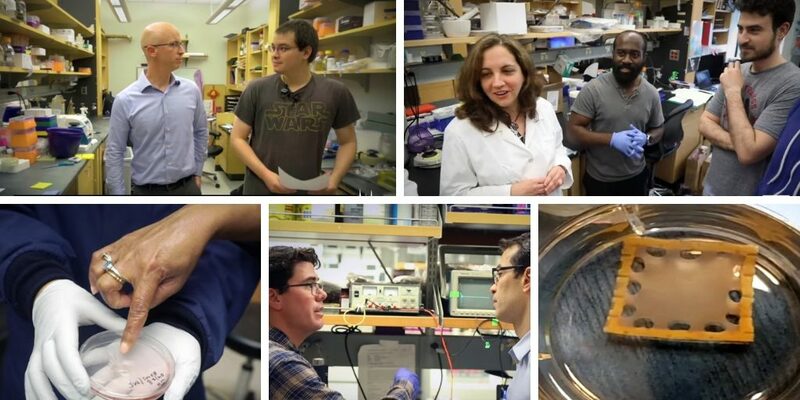 Screenshots from three short videos that highlight interdisciplinary collaborations in the fields of heart, muscle/joint, and neural/brain regeneration. Diabetes is characterized by persistent high blood sugar levels that occur when pancreatic insulin-producing β-cells are destroyed or are no longer able to secrete insulin. But researchers have discovered that other pancreatic cells can come to the rescue when insulin-producing cells are destroyed. 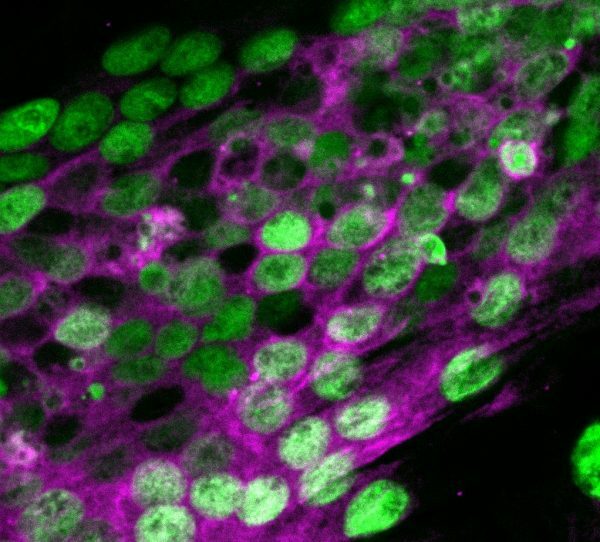 In a new study published in Nature Cell Biology, a group of researchers including Duke Regeneration Next Fellow Valentina Cigliola, Ph.D, have reported that certain pancreatic cell types, the α- and δ-cells, can change their identity and reprogram into insulin-producers to make up for the insulin deficit upon β-cell loss. Mouse pancreatic islet in which alpha-cells have been labeled with a fluorescent tag (green). 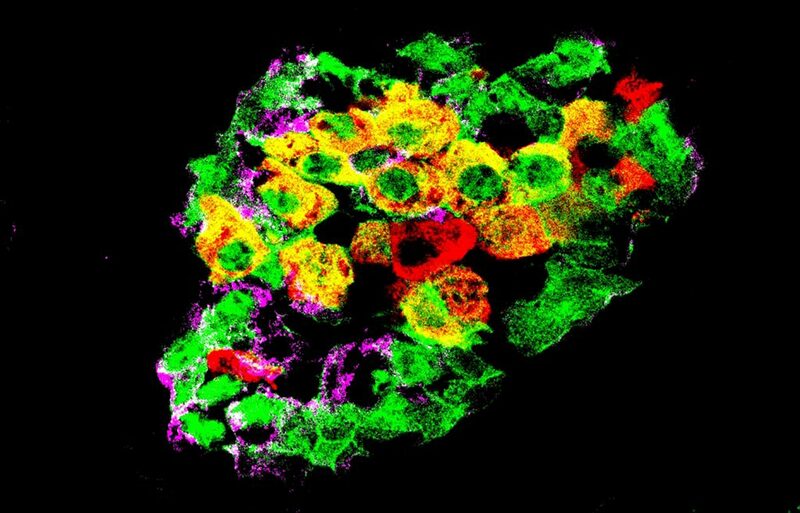 Some of them have started to produce insulin (red), and the morphed cells appear as yellow (green-and-red merge). Image courtesy V. Cigliola. Cigliola, her mentor Pedro Herrera, Ph.D., and their colleagues at the University of Geneva report on the molecular mechanisms controlling how α-cells behave after β-cell loss. By genetically and pharmacologically altering these mechanisms, Cigliola and colleagues were able to significantly increase the number of α-cells that produce insulin. They also showed that this newfound insulin-producing capacity is reversible, with α-cells switching back to their original role when physiological conditions are restored. This study challenges the current belief that mature cell types remain stable and cannot morph into other stem cells, and has implications not only for the treatment of diabetes, but for tissue regeneration in many other organs and disease conditions. This article first appeared on Duke’s Pratt School of Engineering website, and is re-posted with permission. Macrophages (red) within an engineered skeletal muscle tissue disrupted along mature, contractile myofibers (green). Following injury, the macrophages rescue the myofibers from cell death and muscle stem cells activate and contribute to tissue regeneration. Biomedical engineers at Duke University have found a critical component for growing self-healing muscle tissues from adult muscle—the immune system. The discovery in mice is expected to play an important role in studying degenerative muscle diseases and enhancing the survival of engineered tissue grafts in future cell therapy applications. The results appeared online October 1 in Nature Biomedical Engineering. In 2014, the group led by Nenad Bursac, professor of biomedical engineering at Duke, debuted the world’s first self-healing, lab-grown skeletal muscle. It contracted powerfully, integrated into mice quickly and demonstrated the ability to heal itself both inside the laboratory and inside an animal. The milestone was achieved by taking samples of muscle from rats just two days old, removing the cells, and “planting” them into a lab-made environment perfectly tailored to help them grow. Besides a three-dimensional scaffolding and plenty of nutrients, this environment supported the formation of niches for muscle stem cells, known as satellite cells, that activate upon injury and aid the regeneration process. For potential applications with human cells, however, muscle samples would be mostly taken from adult donors rather than newborns. Many degenerative muscle diseases do not appear until adulthood, and growing the muscle in the lab to test drug responses for these patients would benefit from the use of the patient’s own adult cells. There’s just one problem—lab-made adult muscle tissues do not have the same regenerative potential as newborn tissue. “I spent a year exploring methods to engineer muscle tissues from adult rat samples that would self-heal after injury,” said Mark Juhas, a former Duke doctoral student in Bursac’s lab who led both the original and new research. Macrophages are a type of white blood cell in the body’s immune system. Literally translated from Greek as “big eaters,” macrophages engulf and digest cellular debris, pathogens and anything else they don’t think should be hanging around while also secreting factors that support tissue survival and repair. After a muscle injury, one class of macrophages shows up on the scene to clear the wreckage left behind, increase inflammation and stimulate other parts of the immune system. One of the cells they recruit is a second kind of macrophage, dubbed M2, that decreases inflammation and encourages tissue repair. While these anti-inflammatory macrophages had been used in muscle-healing therapies before, they had never been integrated into a platform aimed at growing complex muscle tissues outside of the body. It took several additional months of work for Juhas to figure out how to incorporate macrophages into the system. But once he did, the results changed dramatically. Not only did the new muscle tissues perform better in the laboratory, they performed better when grafted into live mice. The success appears to stem primarily from macrophages acting to protect damaged muscle cells from apoptosis—programmed cell death. While newborn muscle cells naturally resist the urge to throw in the towel, adult muscle cells need the macrophages to help them push through initial damage without going into cell death. 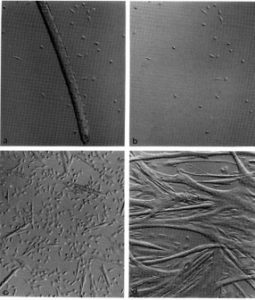 These surviving muscle fibers then provide a “scaffold” for muscle stem cells to latch onto to perform their regenerative duties. Bursac believes the discovery may lead to a new line of research for potential regenerative therapies. According to a popular theory, fetal and newborn tissues are much better at healing than adult tissues at least in part because of an initial supply of tissue-resident macrophages that are similar to M2 macrophages. As individuals age, this original macrophage supply is replaced by less regenerative and more inflammatory macrophages coming from bone marrow and blood. That work is, of course, still years into the future. While this study also showed that human macrophages support the healing of lab-grown rat muscle, and separate work in Bursac’s group has grown complex human muscles containing macrophages, there is not yet a good lab or animal system to test the regenerative powers that this approach may have in humans. This research was supported by the National Science Foundation and the National Institute of Arthritis and Musculoskeletal and Skin Diseases (AR070543, AR065873). On behalf of the Regeneration Next Initiative, I’m excited to welcome Yarui Diao, Ph.D., to Duke University. 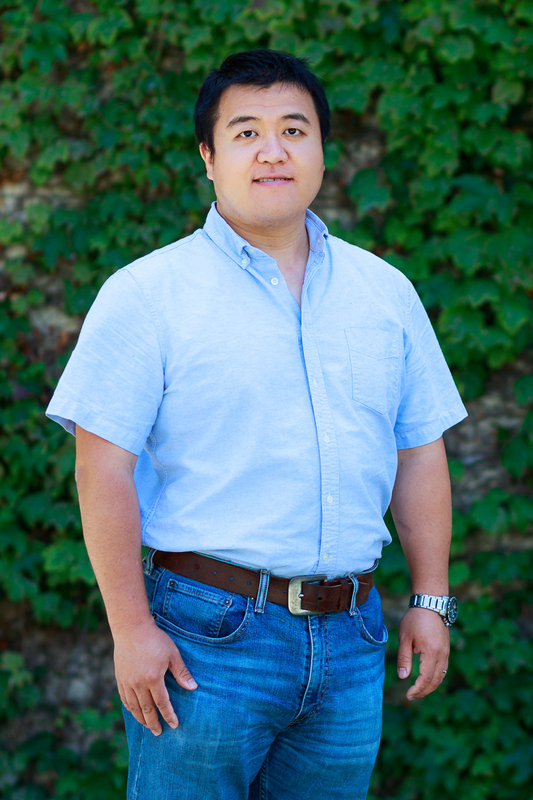 This month, Yarui joins us as a new Assistant Professor in the Department of Cell Biology. Yarui will also be an affiliate of Regeneration Next and hold an appointment in Orthopaedic Surgery. 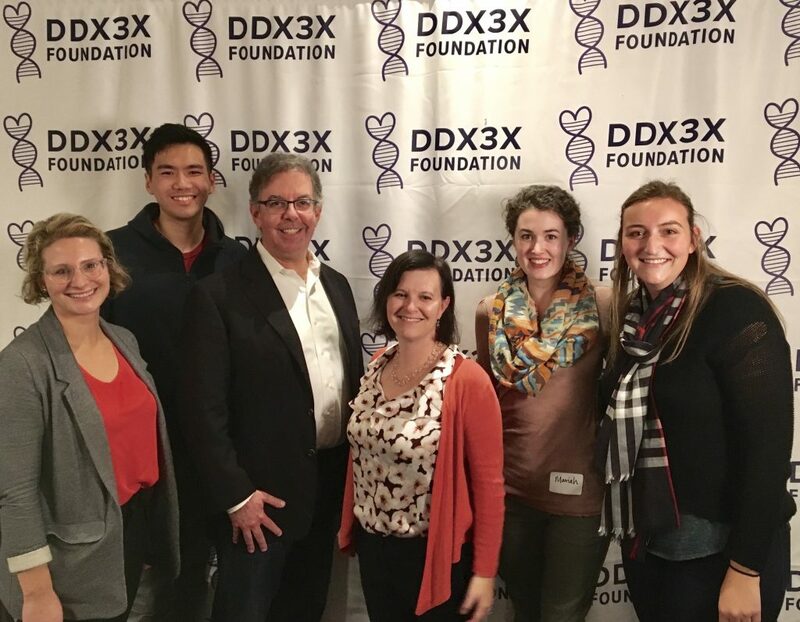 Regeneration Next partnered with Dean Klotman to recruit Yarui to Duke as part of an open search this past year conducted with the departments of Cell Biology and Biomedical Engineering. Yarui followed a highly productive training in skeletal muscle regenerative biology with postdoctoral work in Bing Ren’s lab at UCSD, where he applied cutting edge gene-editing techniques to dissect genome regulatory elements at high throughput in stem cells. Here, he intends to explore the gene regulatory mechanisms that control skeletal muscle stem cell activity and is excited to form new collaborations – indeed, his work in both biology and technology spaces should be of interest to many faculty at Duke. Regeneration Next Executive Director Sharlini Sankaran, Ph.D. spoke with Diao about his research and future plans. SS: Your research focuses on gene regulatory elements. What are they and why are they important? YD: As the name suggests, “gene regulatory elements” refer to the non-coding DNA regions which control gene expression. When the human genome was first sequenced in 2003, scientists were surprised to find that only 2% of the human genome was made up of so-called “coding” genes. More than 98% of the sequence was non-coding. In fact, about 15 years ago these non-coding gene sequences used to be called “Junk DNA” or “Dark Matter”, and many people used to think they were non-functional. But then came the rapid development of the field of epigenetics and next-generation sequencing technologies. These tools allowed us to learn that these non-coding regions of the genome contain extremely critical information to help the cells in our body learn when, where, and how much to turn on or off the gene expression program. These “non-coding” regulatory regions of the genome show highly cell type-specific activity. This activity is what directs cell differentiation – it is what makes our brain cells become brain cells, a muscle cell become a muscle cell, and so on. Each cell type has different morphology, different function, and different gene expression program. You can think of gene regulatory elements as the “Menu” and “instructions” that tell the cell how develop and how to function. SS: These elements are very important in cell development and differentiation, but they also play an important role in tissue regeneration. Can you tell us how gene regulatory elements are important in regenerative medicine? YD: Gene regulatory elements play an important role in almost all biological processes, including tissue regeneration. Let’s take stem cells as an example. In different tissues, there are tissue-specific stem cells, and there are lineage-specific transcription factors that are tightly controlled by gene regulatory elements. These transcription factors need to recognize specific regulatory elements to “turn on” their activity. If we can get a better understand of how gene regulatory elements work, we can get a better understanding of stem cell fate, or how stem cells differentiate into different cell types. If you get a better understanding of gene regulatory elements, it can help you understand the disease mechanisms that are involved in many degenerative disorders and also in the aging process. We know that in aging, a lot of tissue types fail to regenerate at the same rate as in younger people, and these have to do with changes in gene regulation. SS: How did you become interested in this area of research? Tell me a little bit more about your research. YD: I spent my entire postdoctoral career studying gene regulation, but my interest in tissue regeneration dates back to my PhD studies. I wanted to understand how transcription factors can control stem cell fate (what types of cells the stem cells mature into). I found that the transcription factors need to bind to specific gene regulatory elements to do the job. At that time, just 5 – 6 years ago, despite the crucial function of these regulatory elements, it was difficult to precisely identify them in the genome because there were no good tools to characterize the 98% of the DNA that consist of these non-regulatory elements. So for my postdoctoral training, I took a departure from my PhD research of studying muscle stem cells to join Dr. Bing Ren’s lab to study gene regulation. Dr. Ren is well known for using cutting edge technology and tools for studying functions of the non-coding genome. Luckily, at that time, in 2013, there was a new technology called CRISPR-Cas9 that was being developed. This new technology gave me the ability to develop a new method and lead a project to study the functionality of these non-coding gene regulatory elements in a high throughput manner. In my Ph.D. research I, used muscle stem cells as a model system for studying the gene regulation mechanism centered on a master transcription factor called Pax7. We know that Pax7 regulates muscle development and regeneration. Mice lacking Pax7 show severe defects in muscle stem cell activity and muscle regeneration and growth. Very interestingly, I found that loss of Pax7 causes cells to transition into adipocytes (Fat cells) instead of muscle cells. Muscle stem cells are isolated (top) and undergo proliferation, differentiation, and fusion to form muscle fibers (bottom row, left to right). The entire process is tightly controlled by gene regulatory elements, whose dysregulation leads to muscular disorders in disease and aging. Image courtesy Yarui Diao. SS: To clarify – muscle stem cells turned into fat cells? There may be a whole weight-loss industry that would be very interested in this! YD: Yes. We showed that Pax7 binds to a few non-coding regulatory elements to suppress the fat cells’ fate. Without the Pax7, muscle stem cells that would have become muscle cells, matured into fat cells instead. SS: What are the future implications of your research for human health and regenerative medicine? YD: I plan to use muscle stem cells as a model system to understand how gene regulatory networks control muscle stem cell activity. Muscle stem cells are not as “exciting” or popular to study compared to, for example, brain or heart stem cells. The significance of muscle stem cells and their remarkable regenerative potency is often overlooked. We know it’s very hard for the brain to regenerate. It’s very hard for the heart to regenerate. But tissues like muscle and skin have remarkable regenerative ability and we should study them more. If we look at diseases related to muscular degenerative disorders, I would say there is a very urgent need to understand the mechanisms that control muscle regeneration. For example, there are a lot of patients suffering from disorders like muscular dystrophy and muscular atrophy. Remember, muscles are not just there to support our limb movements. Muscles also control essential functions like moving the ribcage when we breathe – so if you have a defect in your muscle function, it can cause huge life-threatening problems. There’s another type of condition called cachexia which occurs in patients with some chronic diseases like cancer. Cachexia is a muscle-wasting condition that causes a rapid loss of muscle function. The genetic and epigenetic basis of cachexia was overlooked by both scientists and physicians for many years, because it is not a direct cause of many diseases. But loss of muscle mass and function causes big trouble for patients. Cachexia is one of the provocative questions we need to address in cancer treatment. If we could find a way to manipulate muscle stem cell function, that would be very helpful to restore mobility and strength to these patients. Also, aging is a condition that affects everyone eventually. Scientists know that in aged mice and aging people, muscle stem cells cannot be properly activated to generate new muscle cells. When injury occurs in older people, these muscle stem cells are less likely to be activated to heal the injury by new tissue formation. So, all these clinical needs are currently unmet mainly due to our limited understanding of the gene regulation mechanisms that control muscle stem cell activity. SS: What are you looking forward to as you move to Duke? YD: I’m very excited to establish my own research lab, as anyone would be after years of PhD and postdoctoral training! As I mentioned, I studied muscle stem cells in my PhD, and I studied gene regulatory elements in my postdoc, and I’ve had a long-standing interest in regenerative capacity and disease conditions. When I published my Cell Stem Cell paper during my PhD, I got a lot of phone calls from patients. Even though my research was very far removed from clinical treatments, there was still a lot of interest from patients. This encourages me as a scientist to do a better job of learning how translate this knowledge into future therapies to help people. At Duke, and in North Carolina in general, there’s a very good environment to collaborate and push forward my research. There are a lot of people working to understand the role of gene regulatory elements in general, and also specifically in muscle stem cell function. For example Charlie Gersbach is a genome engineering expert who is also very interested in muscular disorders, and Ken Poss is a pioneer in heart regeneration who has uncovered tissue regeneration enhancer elements that help zebrafish hearts regenerate. I really look forward to working with these great people, trying to generate new knowledge and make an impact in science. I’m also very excited to become a teacher. My parents are teachers in China, and my parents-in-law, my grandmother and grandfather, were all teachers. When I was a kid, I thought being a teacher is the best job in the world. I’m so happy to come to Duke to be a researcher in a great environment, but also to become a teacher to help train a new generation of future scientists. Most of us take for granted that our bodies and organs have the ability to heal after an injury, but rarely stop to ponder how. We know that the healing process occurs by filling the space created by the injury. This can happen in one of two ways: by making cells bigger (a process called hypertrophy) or by dividing cells to make new ones. For over a hundred years, scientists have sought to understand why some organs undergo hypertrophy, and if that process has any advantages over cell division. In a new study published in the journal eLife, Duke researcher Donald Fox, Ph.D., and his team identified a gene, known as “Fizzy related,” that regulates hypertrophy in fruitfly cells after organ injury. They found that in injuries requiring many cell divisions or many rounds of hypertrophy to heal, cell divisions led to organ distortion and loss of permeability, whereas hypertrophy had no substantial effect on the repaired organ. Intestinal cells in fruitfly larva showing repair after injury. Magenta = intestinal cells, green – cell nuclei. Image courtesy Erez Cohen, Duke graduate student and the paper’s primary author. These findings may benefit researchers interested in therapeutic organ regeneration, because the results identify a molecular target that could potentially be used to alter an organ’s repair capacity. They also highlight a potential protective effect of hypertrophy in injured tissues. Hypertrophy has been observed in humans, following injury to the liver, heart, or kidney. While often viewed as mal-adaptive and non-regenerative, this study’s results suggest that there may be a protective effect to hypertrophic tissue repair. Read more about this paper and its implications in the Duke Medical School Blog. Skeletal muscle stem cells (MuSCs) play a vital role in the repair and regenerative functions of our muscles after injury. As those of us over forty may know firsthand, this function declines with age and contributes to impaired muscle regeneration in older individuals. Despite what you may see in internet ads, there are currently no stem cell injection treatments that can reverse this decline in muscle regeneration function. However, thanks to a new report from Duke University’s Department of Medicine (Hematology), scientists are a step closer to identifying treatments that target molecular pathways related to cell survival. They hope that age- or disease-related muscular degeneration can be slowed or even reversed by identifying and restoring function of these molecular pathways. In this recently published report, Duke researcher James White and colleagues identified a molecular pathway that regulates several natural phases of the MuSC cell cycle. This pathway, the AMPK/p27Kip1 pathway, regulates key processes including autophagy (cellular recycling to turn old proteins and other substances into energy and materials for new structures) and apoptosis (cell death). Aging cells tend to exhibit less autophagy and more apoptosis, which ultimately leads to reduced regenerative and repair capacity in older adults. In the paper, published in the journal Stem Cell Reports, White and colleagues found that the balance between the processes of autophagy and apoptosis is crucial in determining whether an MuSC survives and can assist with muscle repair. They found that MuSCs in aging mice exhibit less autophagy and more apoptosis, and are more susceptible to cell death than the MuSCs of younger mice. White and colleagues determined that aging MuSCs have dysfunctional signaling of the AMPK/p27Kip1 molecular pathway. When they activated the AMPK/p27Kip1 molecular pathway in old MuSC, they found increased cell proliferation. In addition, restoring AMPK/p27Kip1 signaling increased the survival rate of transplanted aging MuSCs. White and colleagues conclude that this pathway could be an important potential therapeutic target for improving muscle regeneration in older individuals. An epifluorescence microscopy image of a rat neuron. Bright spots reveal synapses (connection sites). Image courtesy Chris Risher. The brain is a highly complex organ that enables us to think, remember, move, and perform simple to complicated tasks. These tasks use brain circuits that are made up of connections between cells called neurons. Neurons contact each other at sites known as synapses, and the human brain is estimated to contain trillions of these connections. The way that synapses form in the brain, and how faulty connectivity may lead to brain dysfunction, are still largely unanswered questions in neurobiology. In the last decade and a half, research has pointed to a non-neuronal basis for regulating synaptic connectivity. Star-shaped “connector” cells known as astrocytes, which far outnumber neurons in the brain, secrete factors that modulate the timing and extent of synapse formation. One of these factors, an extracellular protein called thrombospondin (TSP), was previously shown to promote synapse formation via a receptor, α2δ-1. But the mechanism of synapse formation was not yet known. Risher used a technique called three-dimensional electron microscopy to study synapse formation in mice brains. In this paper, they show that that α2δ-1 is required for the structural maturation of synapses. They determined that a molecule produced by α2δ-1 stimulates structural maturation of neurons. Mice neurons that lacked α2δ-1 or the molecule it produces remained in an immature state. When they restored the receptor and its functions, the synaptic deficiencies were reversed. This paper lays the groundwork for future therapies and treatments targeting conditions that are caused by deficient astrocyte-to-neuron signaling. One such drug, the FDA-approved drug gabapentin (Neurontin) is used to treat a variety of neurological conditions and works by targeting TSP and α2δ-1. In humans, defects in TSP, α2δ-1 and their signaling partners have been implicated in autism, epilepsy, and other neurological conditions.